We invite you to join us at our Wednesday morning service. This is a traditional Anglican service that shares the Lord’s Supper twice a month and Morning Prayer every other Wednesday. The singing of well-known hymns that have been enjoyed over many years is greatly enjoyed each week. We place emphasis on hearing the Bible read and explained, and we spend time in prayer for issues and concerns both local and global. This Wednesday gathering is especially suitable for those who find it difficult to get to church on a Sunday and we will happily assist with transport to church for those who no longer drive. Come early for wonderful fellowship over morning tea at 10am before the service starts at 10.30am and share in a special time together as we sit and chat about our week and the world. The connect group for people from our Wednesday morning congregation meets over lunch once a month for mutual support and encouragement as they share around God’s word together. Once a month, after the service at around 11.30am, we join the popular Orana group (seniors' fellowship) in the church hall, to enjoy a delicious lunch and hear from an engaging guest speaker. This is a wonderful time of friendship and everyone is invited, whether you’ve never been to church before or you’ve been coming for many years. So plan to come along to enjoy a delicious lunch and hear a stimulating talk especially geared for seniors. We look forward to meeting you on Wednesdays. Pauline’s passion is that women should be in a deeper relationship with God through meeting with him as they read his word. 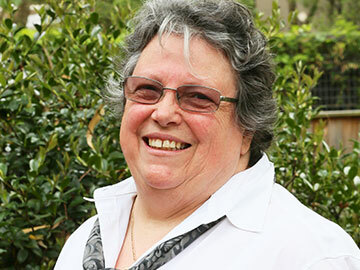 She is a part-time pastoral care minister, focussing on women and works three days a week, (Monday, Wednesday and Thursday). Pauline attends both Wednesday Church and the 8 am Sunday morning service.